As the world remembers the 9/11 tragedy today, I think back to those two hours on that Tuesday morning nine years ago when I couldn’t find my brother. He worked in the building in the middle of this photo, the one standing behind the shorter building with a similar pointed top. When I called him on his cell phone seconds after I learned about the planes hitting the World Trade Center, I couldn’t get through. Soon the redial button on my phone formed a little indentation from repeated pressing. It wasn’t until around 11am Central time that he called me back. Thank goodness. I pictured him walking out of the subway station at the WTC and heading to his office in 3 World Financial Center earlier that morning. He always arrived at work late and would have stepped out out of the subway around 9:15, between the first and second strike. “I’m actually in Broolyn today,” he said. My heart jumped and before he finished speaking, I knew a lucky hand of fate had saved my brother that day. A year later, I sat in my brother’s sunny living room in Brooklyn, talking casually to a cousin who lived nearby. 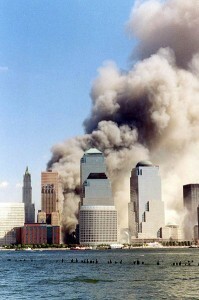 She spoke of a friend of her husband’s who had worked in the WTC during the 1993 truck bombing. He got so fed up, my cousin said, that he decided to move his family to Boston. He would take them out of harm’s way. Sadly, my cousin’s friend had a business meeting on the west coast on September 11th. He was on one of those flights out of Boston Logan. So many people have stories about that day, whether they were near misses like my brother’s, or bad luck like my cousin’s friend. One of the speakers at the conference in San Diego was a woman whose husband died on 9/11. He didn’t work there but was in a meeting at Windows on the World. Might have been the one that bumped your brother’s meeting. Her name is Abigail Carter and she has a book and website called the Alchemy of Loss. Glad to know your brother was out of harms way that day. Thank you so much, Wendy. I have goosebumps reading what you wrote. The world is really very small. I’m going to check out Abigail Carter’s site and her book and will pass it on to Jonathan.